Shawnee Peak is offering two lift tickets for just $92 in honor of 75 years of great skiing. Come be part of our season of celebration. $92. for two lift tickets is an incredible savings. Shawnee Peak is offering special savings to help celebrate our 75th anniversary. We want you to help us commemorate our rich history as Maine’s oldest ski area. Right now for a limited time, two lift tickets can be purchased for just $92. in honor of our season of celebration. The 2012-2013 ski season is just about here and we are planning a diamond celebration weekend in January. On January 12th, we will be hosting a gala event that includes dinner at the mountain and of course fireworks. Limited tickets are available to be a part of that unique event. We will also be highlighting our history throughout the season with contests, events and special promotions. Come be a part of our season to celebrate. You never know who you might see on the mountain, as the festivities honoring 75 fantastic years get underway. Shawnee Peak is a privately-owned, family ski resort in Maine. Celebrating it’s 75th year of operation, the mountain boasts 98% snowmaking, 1300 feet of vertical drop, 239 ski-able acres, 40 daytime trails and 19 lit trails for night, as well as two terrain parks. The mountain is family-driven, affordable, and provides skiing and riding for all levels and abilities. 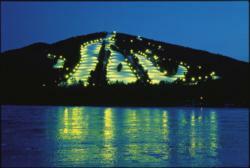 To learn more about the mountain, special offers and our 75th Anniversary, visit http://www.shawneepeak.com.